The DBS Update Service - is here. This spring, the DBS will launch a brand new product; the Update Service. This will dramatically change the way you carry out criminal record checks, making it much easier and quicker for you to recruit or recheck your employees and volunteers. The Update Service will be free-of-charge for volunteers. It will cost around £10 to everyone else. When you take on new staff, if they have registered with the new Update Service, all you need to do is ask to see their DBS certificate and carry out a free, online check to see if it is still valid and up-to-date. Just think, no more forms to fill in and rechecking becomes quicker and easier to do. When the service is launched, applicants will apply for a DBS check (in the normal way). They can, at the same time, apply to register online for the Update Service. If they do they will be able to take their DBS certificate with them, from job-to-job (in the same sector), and may never need to apply for another one, ever again. 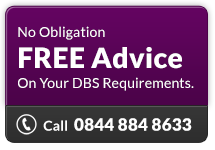 You also benefit, as you will be able to check the DBS certificate online and get instant results.